There isn't enough room in a single post for all of the contempt and ridicule NBC's latest hiring move deserves. The PR department at its MSNBC cable outlet waited until early Saturday morning to tweet its announcement that Ben Rhodes, the Obama administration's Deputy National Strategic Advisor for Strategic Communications, would be joining both NBC and MSNBC as a "Political Contributor." Who knew that systematically misleading and ridiculing the press while in office in the name of selling the fatally flawed Iran nuclear "deal" would be a resumé enhancer? While Donald Trump was hate-tweeting on Monday morning about Morning Joe and the gossip site rumors surrounding co-hosts Mika Brzezinski and Joe Scarborough, the latter co-host prided himself as being a Trump critic (he wasn’t) but more importantly called out the Obama administration and government for collectively having “blood on our hands” for the inaction in Syria’s civil war to, in part, preserve the Iran nuclear deal. A year ago, Tim Graham at NewsBusters noted that the New York Times was "offering 13-day tours of Iran guided by Times journalist Elaine Sciolino" at the bargain rate of $6,995 per person. Among other things, it promised "excellent insights into ... (the) life and accomplishments" of Ayatollah Khomeini, the ruthless Islamist leader who posed as a liberator, but then imposed a fundamentalist Islamic state after taking control of that country in the late 1970s. Those tours are still active, and popular. Given that background, I suppose we really shouldn't be all that surprised that Ira Stoller at SmarterTimes.com reported a related development this morning. With the imminent lifting of Western sanctions against Iran, the ever-opportunistic International division of the Times is cohosting an October 6-7 "Oil and Money" conference in London (I promise, I'm not making this up). On Wednesday night, ABC was the lone network to omit from their coverage of the Iran deal rally that Iranian Supreme Leader Ayatollah Khamenei offered a new rant hours earlier in which he promised the country will not cooperate with the U.S. on any other issue beyond the deal in addition to predicting that Israel would not exist in 25 years. For Iran, Mike? On today's Morning Joe, reliable Obama fan Mike Barnicle managed to keep a straight face while lauding the Iran deal as an "extraordinary feat." He did so despite poll numbers displayed showing that a huge majority of Americans don't think the ayatollahs will keep their promises. Let's see: sanctions lifted while centrifuges keep spinning and nuclear scientists beaver away in hardened, bomb-resistant facilities. Extraordinary, yeah. Update (13 Feb. | Ken Shepherd): Tomaso responds here, dismissing the notion that he exhibited any liberal bias. Commenters to his blog post are divided. Condescending secular elitism isn’t just for the coasts anymore. It can even come from red state Texas. 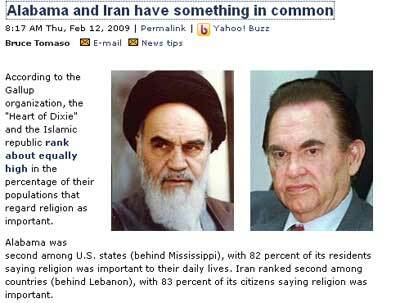 On The Dallas Morning News’s Religion blog Feb. 12, Bruce Tomaso wrote a post called “Alabama and Iran Have Something in Common.” It stemmed from a recent Gallup poll that asked people around the world, “How important is religion in your daily life?” The poll found, among many other things, that nearly the same percentage of the population of Iran (83 percent) and Alabama (82 percent) said that religion was important to them.